Your family will love these classic Bible stories with bright colors and fun shaped pages! 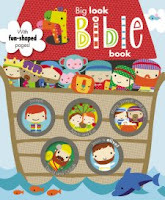 Big Look Bible Book is the perfect way to start engaging your child with some of the most-loved stories from the Bible. Creatively designed for young children who are learning more about God and about some of the most-beloved people in the Bible, the Big Look Bible Book is a fun and unique way to show children the Word of God! Each page is fully illustrated with colorful artwork, and every page has shaped pages to make the stories memorable and unique. right side! Nine favorite Bible stories are told in a fun style. Stories include Noah and the ark, Joseph, Moses, David and Goliath, Daniel and the lions’ den, the nativity, and many more! This book is super cute for little ones. The pictures are bold and BIG! The pages are stiff and contoured around the characters. It's hard back so it will not get easily damaged. The cover has window cut outs to give it a more dimensional look, but you can't put your fingers through them or anything like that. Last but not least, it contains several of the most well known Bible stories such as Adam and Eve, Joseph, David and Goliath, Daniel in the Lions Den, and Jesus' Birth. It is written in very simple language young children can comprehend. My favorite things about this book were the cute cover and the awesome illustrations. It's sure to capture any toddlers imagination and attention. I would recommend for very young children. I was blessed with a free copy of this book from BookLook and Tommy Nelson. I was not required to review positively and all opinions are my own.